The key to solve most brain teasers is to familiarize oneself with the given type of puzzle using the beginner, or easy, forms of the challenge. With experience, puzzle solvers move towards more advanced categories. 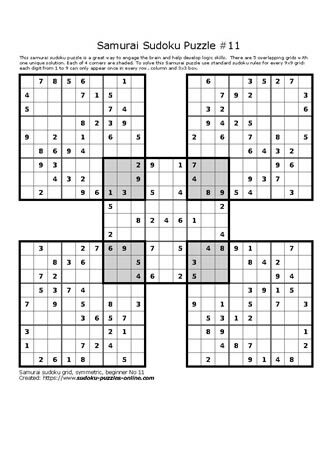 With this beginner Samurai Sudoku puzzle, use basic rules of Sudoku to determine the solution. Remember that there are 4 corners that are interconnected and depend on both puzzles correctly being solved. This ensures that the center puzzle is completely correctly.